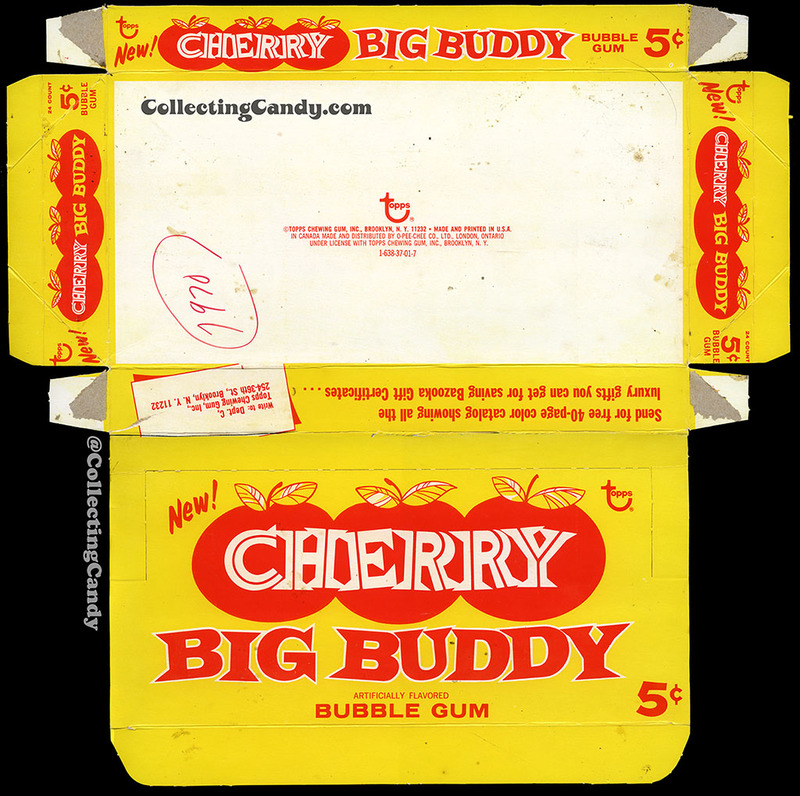 ← 1980’s Mountain Chew Bubble Gum – An Unusual Blend of Brand Knockoffs! – Plus CollectingCandy.com’s 6th Anniversary! Before I get into it, I wanted to highlight that today’s post is the culmination of years of research and hunting, finally coming together by way of a significant addition to my historical materials just recently, thanks to fellow collector and friend. And as is the case with so much of what we write about and publish here on the site, the vast majority of today’s material has never been published before and was previously unknown or as I like to say, “un-Google-able”. You won’t find this information or these images anywhere else, so let’s get to it! 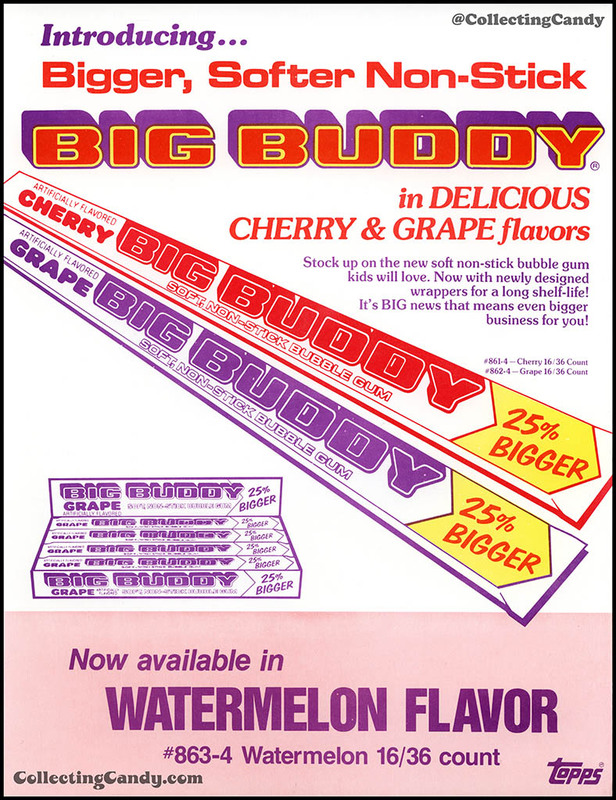 Big Buddy launched sometime in the mid-1960’s, at least as early 1968 though it could have been a littler earlier than that. 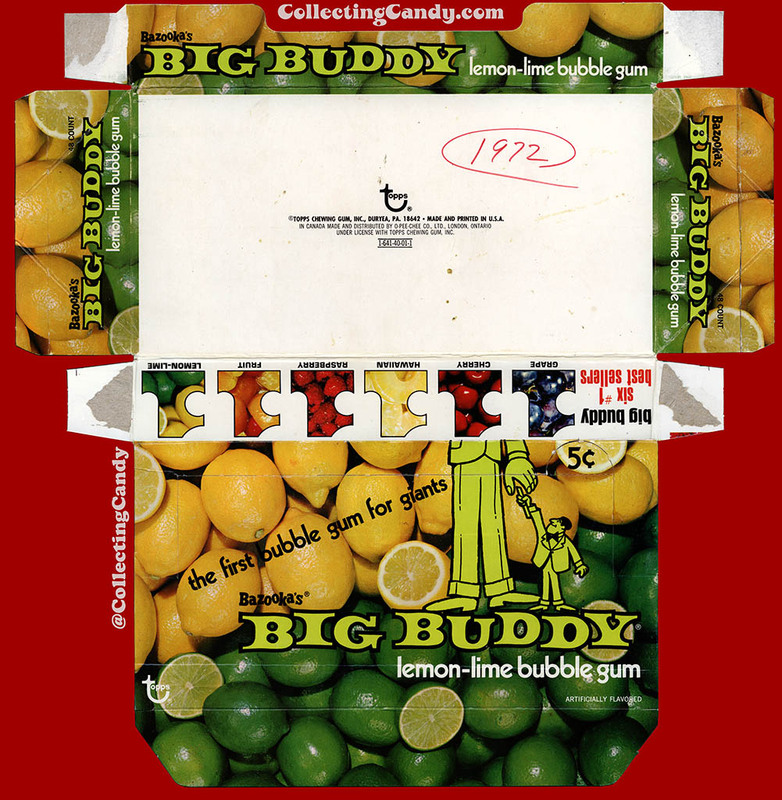 It was a period when other “big stick” bubble gum brands were similarly being launched and were quite popular: There was Big Boss from Philadelphia Chewing Gum and one of my favorites, Bub’s Daddy from Donruss! 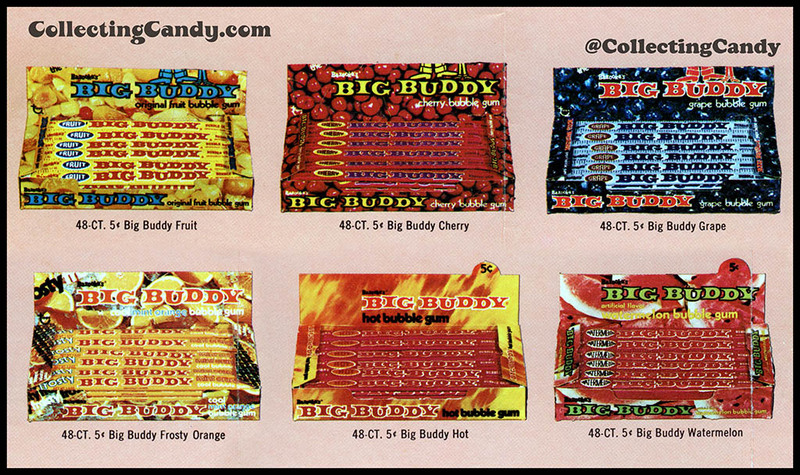 The novelty of these brands was that, unlike typical bubble gum that arrived in convenient bite-sized pieces, these burst onto the scene like confectionery ruler-length slabs. Too big to chew in a single session and impressively long. 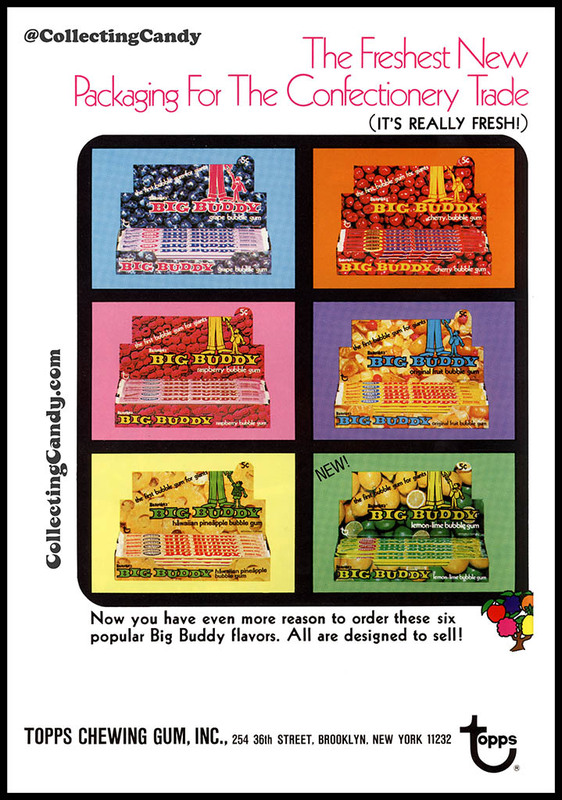 The earliest version of Big Buddy wrapper even sported an on-the-pack ruler, a design feature that would be copied some years later for the Mars’ Marathon bar (another favorite of mine). 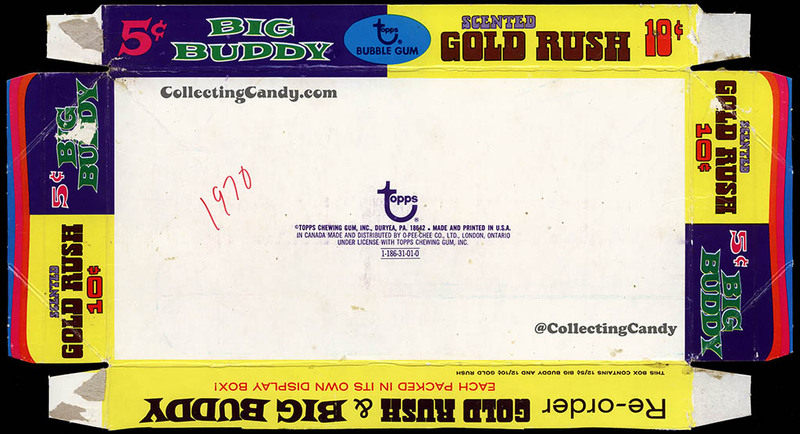 Big Buddy was clearly a success, and it rapidly became a brand that was cross-promoted and cross-sold/packaged as you can see in this combo display box, that featured half Big Buddy and half Topps Gold Rush bubblegum in the unusual “scented” flavor. 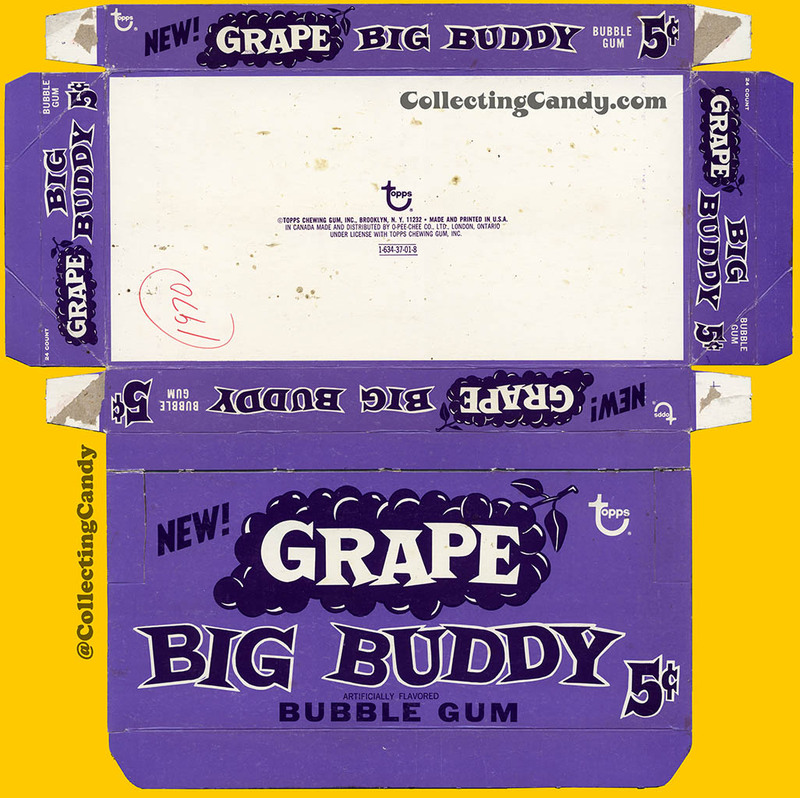 By 1970, the success of Big Buddy was clear and so much so that Topps was introducing the first flavor extensions for the brand, Grape and Cherry. 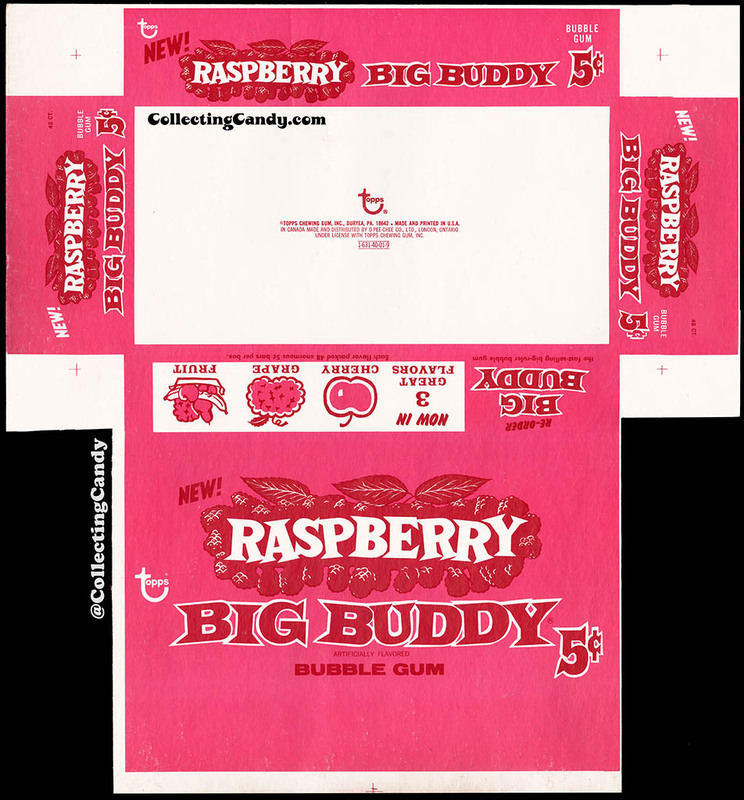 It would appear that Big Buddy initially started at a 1.2 oz size, and was quickly reduced to 1.1 ounces. 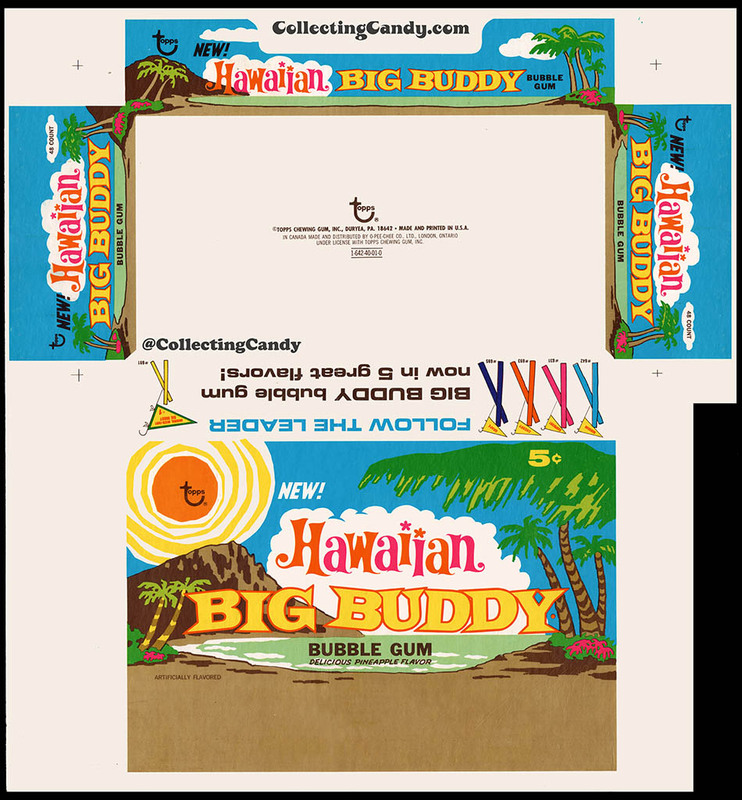 Next up is an interesting piece, as it is an uncut display box for what what was a variety assortment of Big Buddy – eight flavors all in one box! By 1983, the end was closing in on Big Buddy. 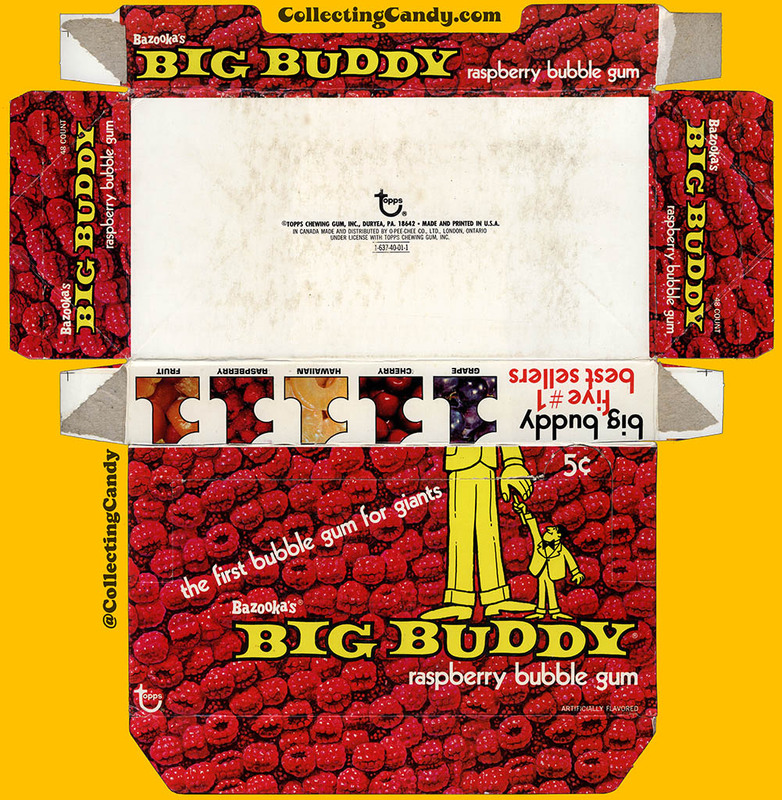 I speculate that the decline was related to the massive shift in popularity toward the “soft chunk” category of bubblegum with brands like Bubble Yum, Bubblicious and Hubba Bubba. 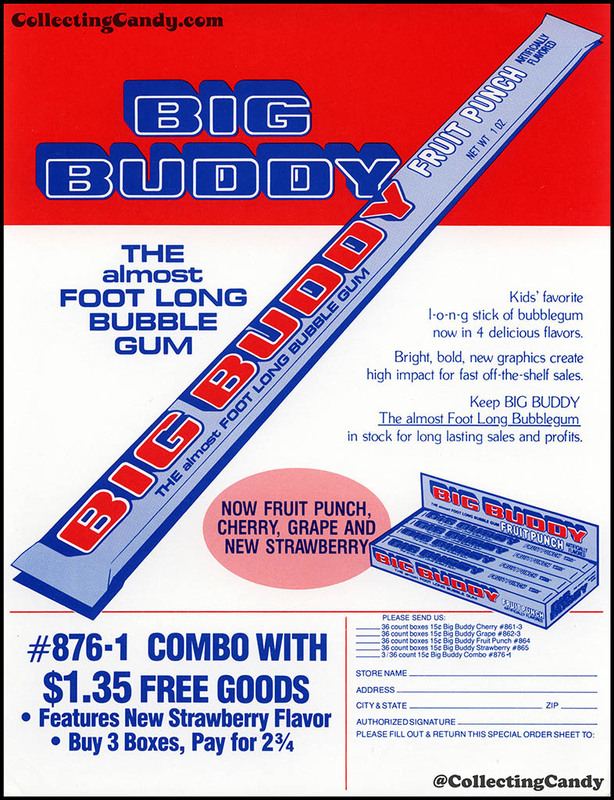 1983 would appear to have been the end of the Big Buddy bubblegum brand. 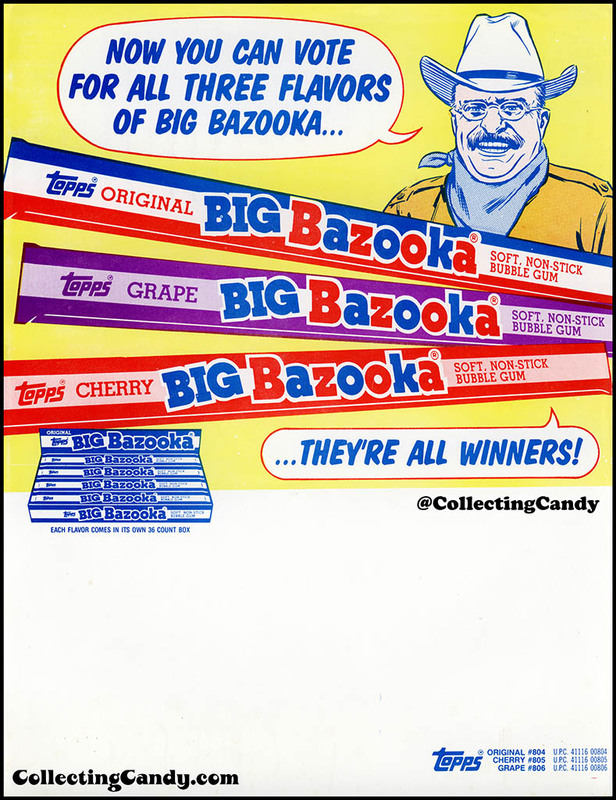 In 1984, Topps attempted to keep the format alive through a re-branding, wrapping it into the iconic Bazooka family and calling it “Big Bazooka”. 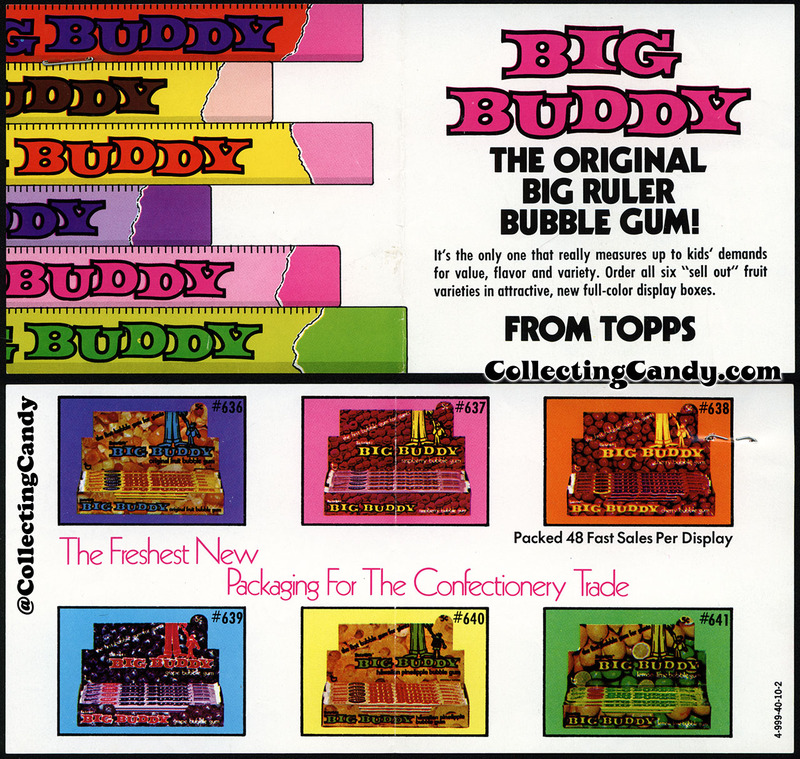 And so, after sixteen years and eleven different flavors, Topps’ Big Buddy brand would be retired, ending a major chapter in the “big stick” bubblegum category’s history. 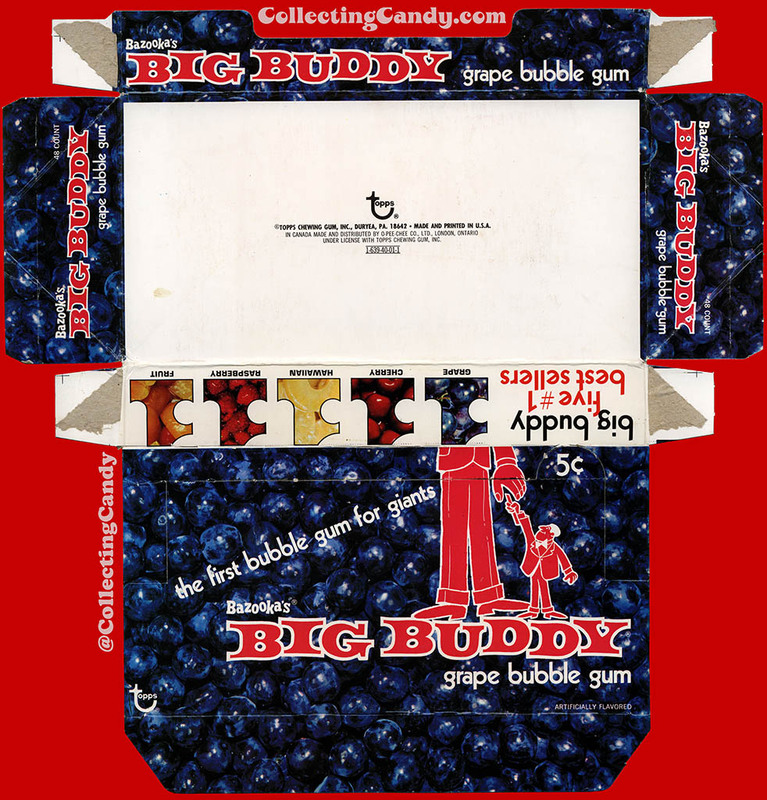 The other powerhouse player in the category, Donruss’ Bub’s Daddy, would follow suit a few short years later, leaving no other widely sold big stick bubblegum brands available. Times and tastes had changed, but what a ride it was for a brand that I always thought was pretty darned cool. Thanks for the memories, Big Buddy! 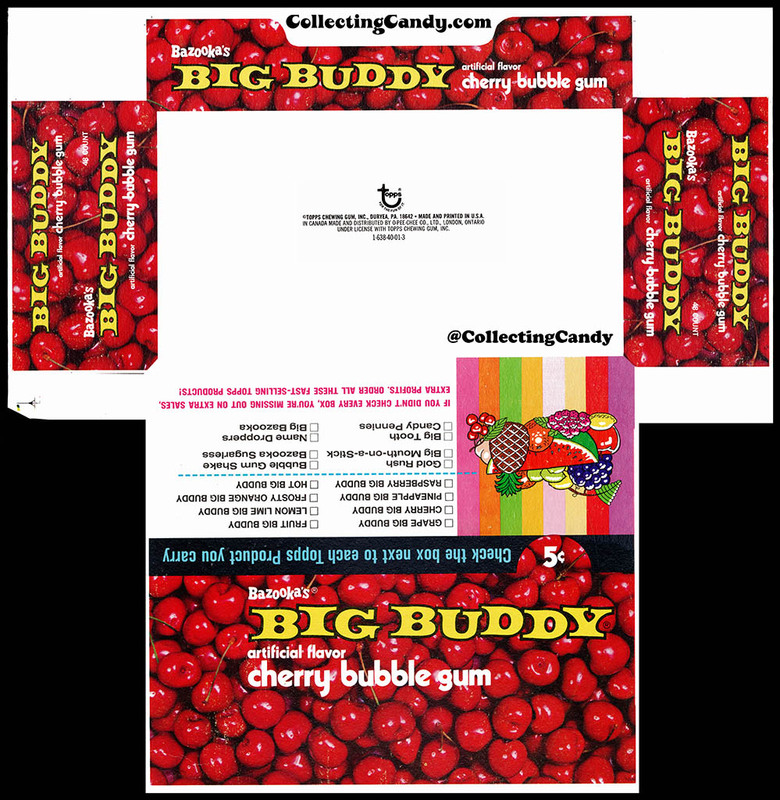 Today’s post is an extension of the celebration of CollectingCandy.com’s 6th Anniversary. 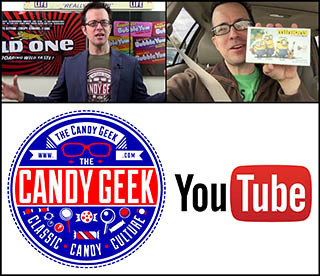 It’s the kind of article that deep dives into a brand that has been virtually forgotten to history, and one that aims to document and preserve it in a way that only CollectingCandy.com can. 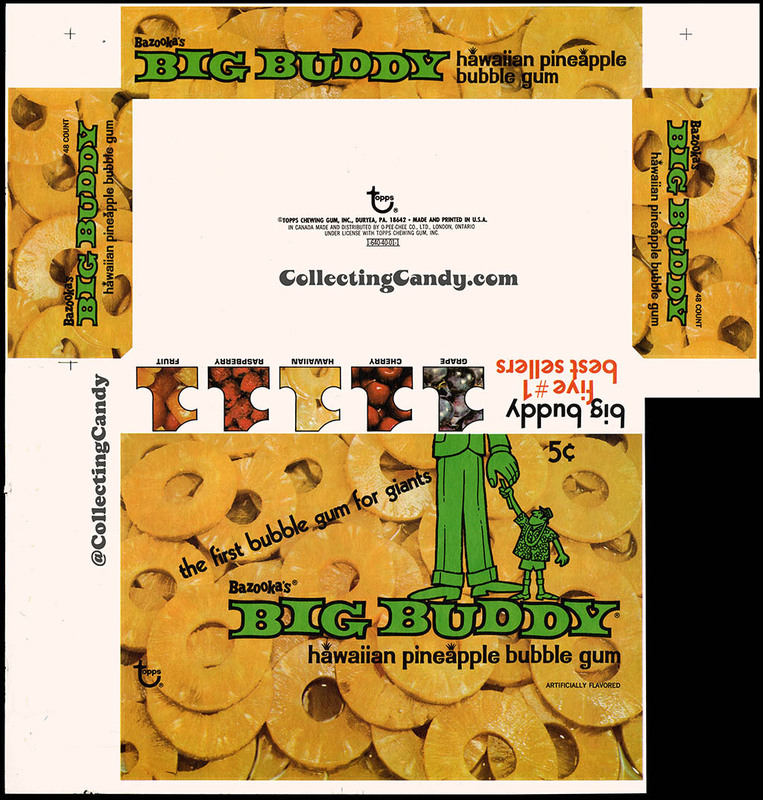 With over two dozen vintage wrappers, a dozen vintage display boxes and various promotional flyers and industry clippings, the documenting of the history of the Big Buddy brand has now been established, and as I discover new pieces going forward I will work to figure out how they fit into the existing puzzle. Undoubtedly, my understanding of the brand’s timeline may evolve, but that’s the fun of it! 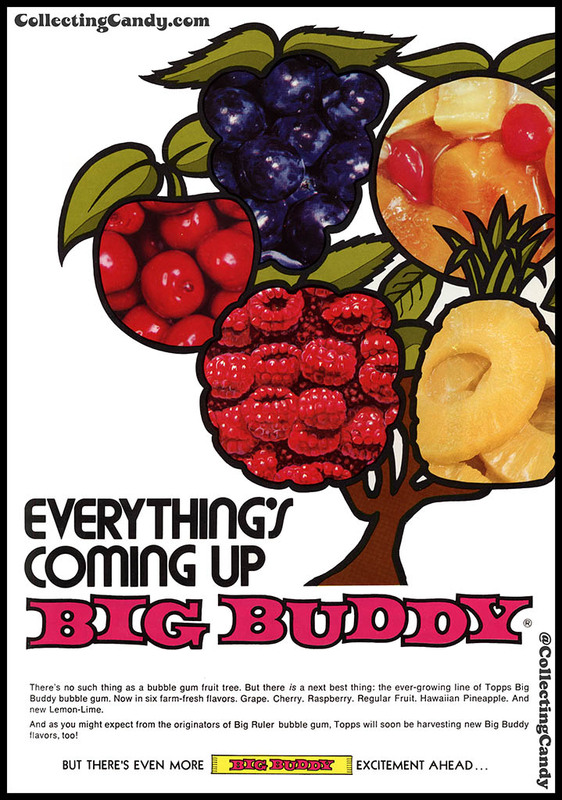 So with that, I’ll sign off on all things Big Buddy for now. If anyone remembers this classic brand, please leave a comment and share your story. See you next time! 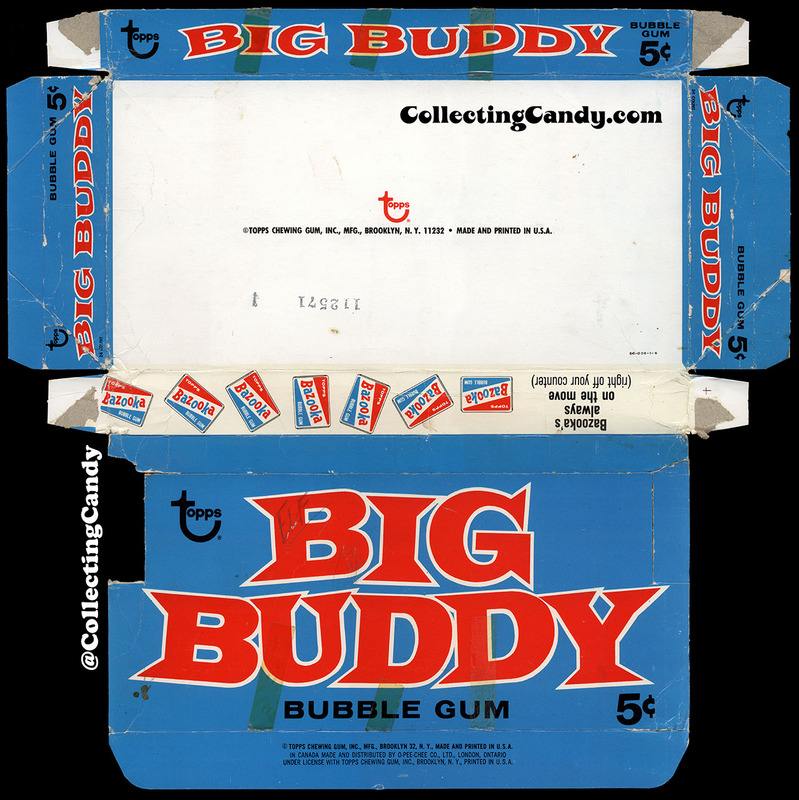 This entry was posted in 1960's, 1970's, 1980's, Bubble Gum, Topps and tagged Big Buddy, big stick, Bub's Daddy, bubble gum, bubblegum, candy collecting, candy collection, candy collector, candy wrapper collection, candy wrapper collector, collectible, collecting candy, confectionery, confections, packaging, packaging design, sweets, Topps, vintage candy wrappers, wrapper. Bookmark the permalink. 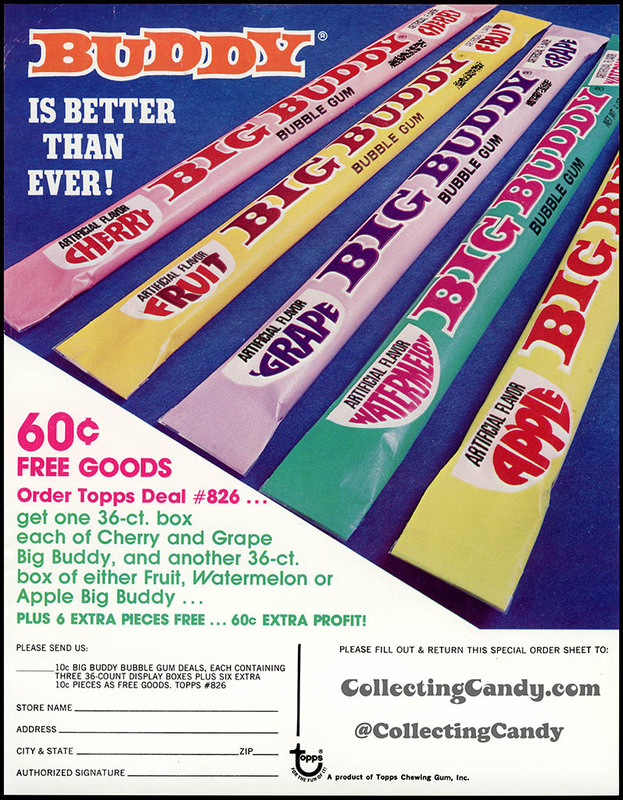 10 Responses to Bazooka’s Big Buddy – A “Big Stick” Bubblegum History 1968-1984! Once again,- I enjoyed the nostalgic trip. 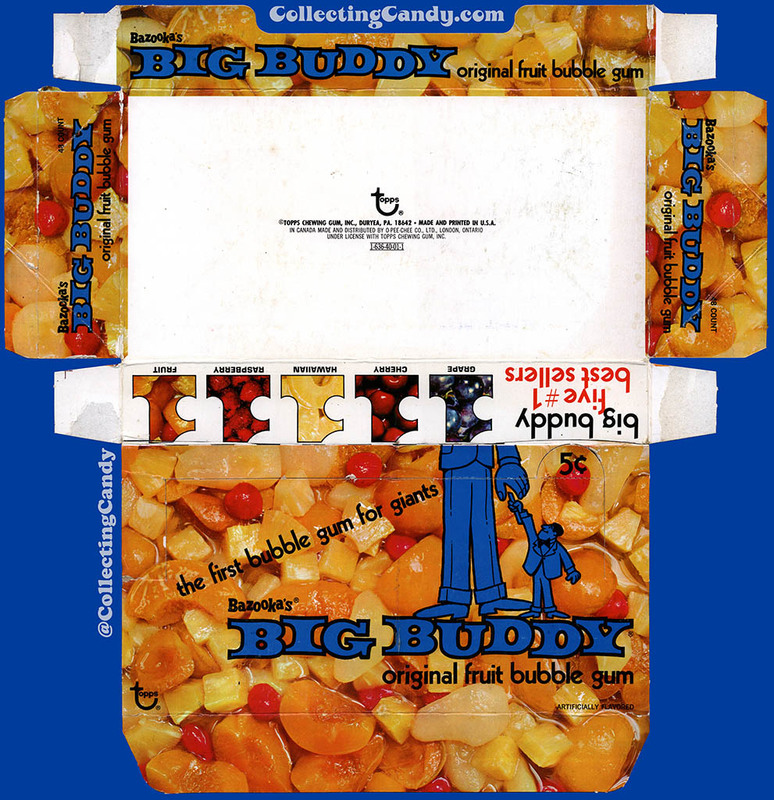 Although I have little memory of Big Buddy, I do recall it best from its Wacky Packages appearance as Big Baddy. Love the article and the “archeology”! 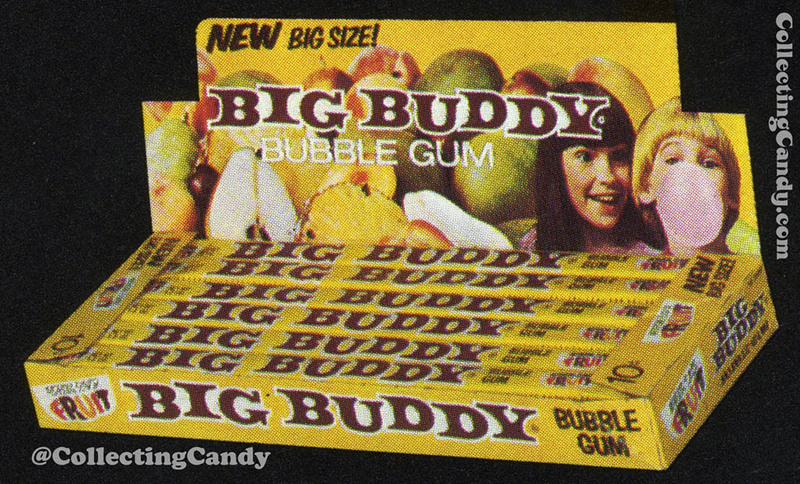 I have a vivid memory of chomping on a stick of Big Buddy “Frosty Orange” bubble gum, while sitting in my mom’s friend’s car, opening a Hot Wheels Heavy Weights Moving Van… in the Child World parking lot… in Fitchburg, Massachusetts… it was a slightly overcast day… in January… 1974. I can’t tell you what I had for lunch today, but I remember every detail about the things that matter in life! Thanks again for stirring up the nostalgia! Thanks for the wealth of information on this brand. You continue to deliver the goods. 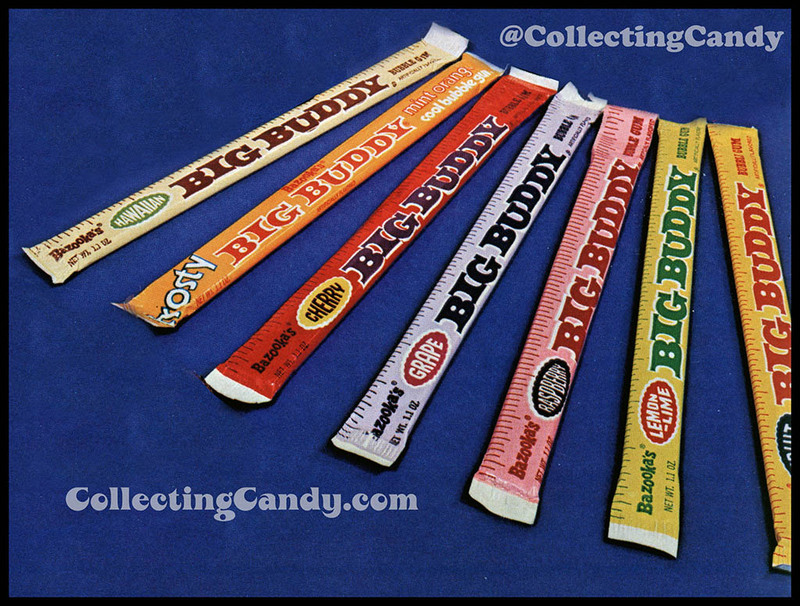 Would you say that the Big Buddy giant and unnamed “little buddy” mascots were only around from 1972-1973 then? I think it’s possible that they were showing up on display boxes in late 1971.. maybe. 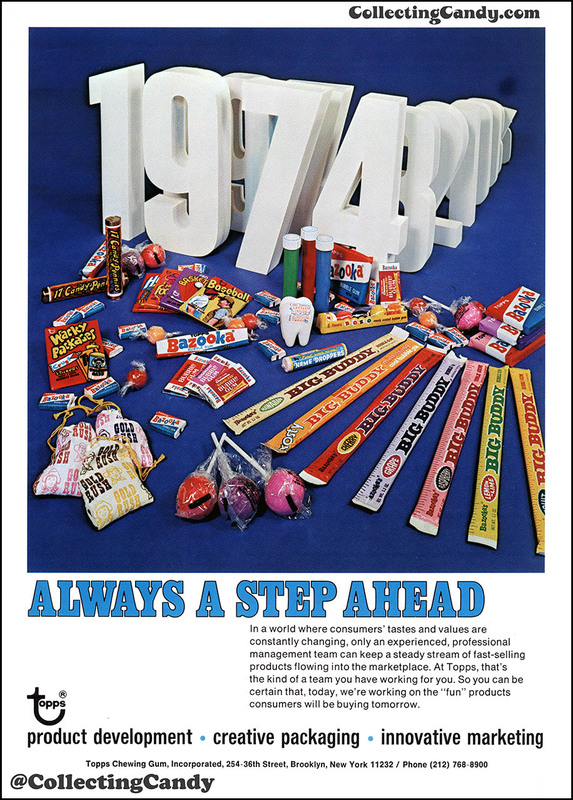 I mean, they’re shown in a January 1972 trade ad, and that at least offers the possibility of a late ’71 intro for them. 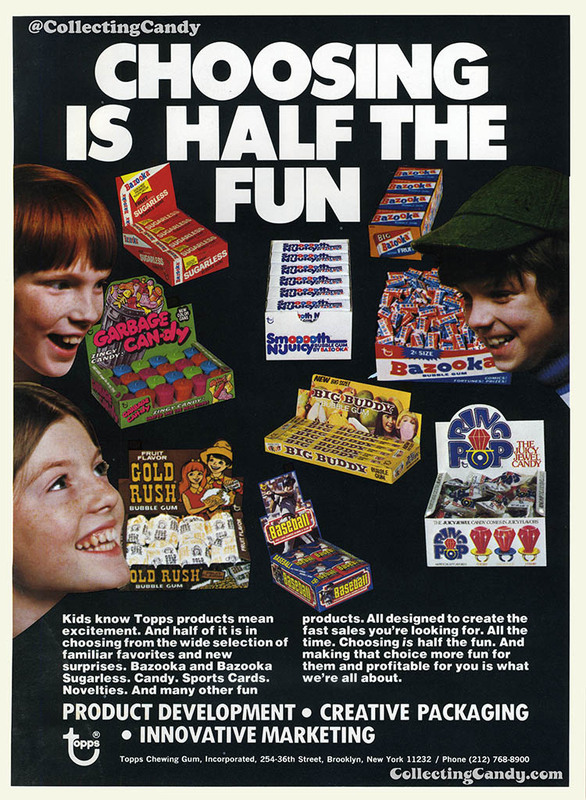 And I also think they may have still been used on some flavors into 1974, as they are still shown in the 1974 Topps brochure. I think the safest bet that I’d make, given the data I’ve been able to gather, is that you can guess these likely hit 1971-1974, but definitely were all over throughout 1972-73. Amazing post (as always). Thanks Jason! as I grew up in the 1960’s and 70’s). We were discussing our favorite Bubble gums. 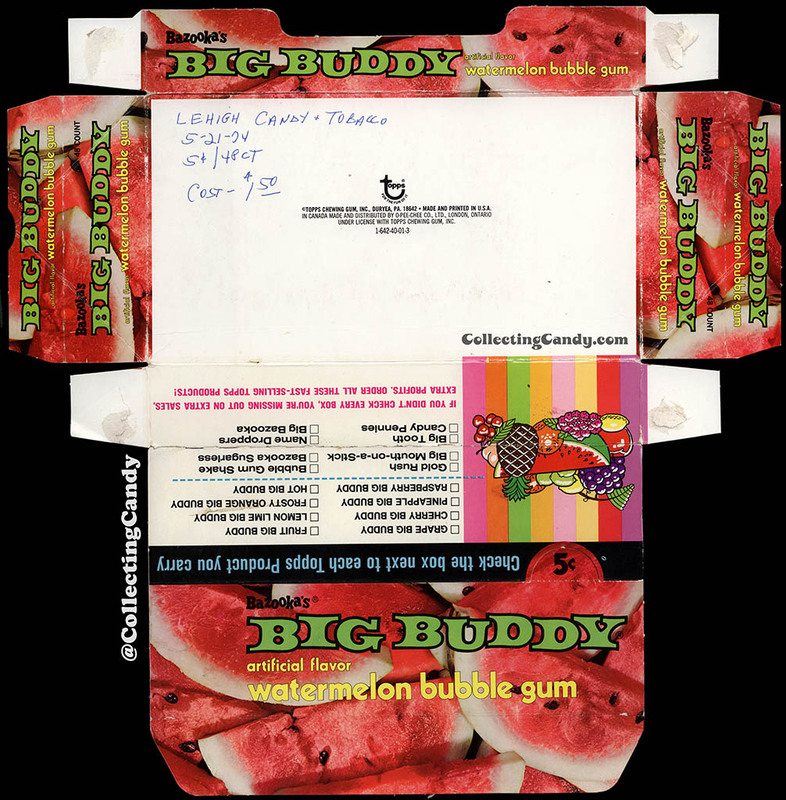 I then told him about the time as a young girl (think I was 8 or 9 years old) that I got a Big Buddy and when I peeled back the paper, the paint from the wrapper had stuck to the gum (my favorite was fruit flavor). 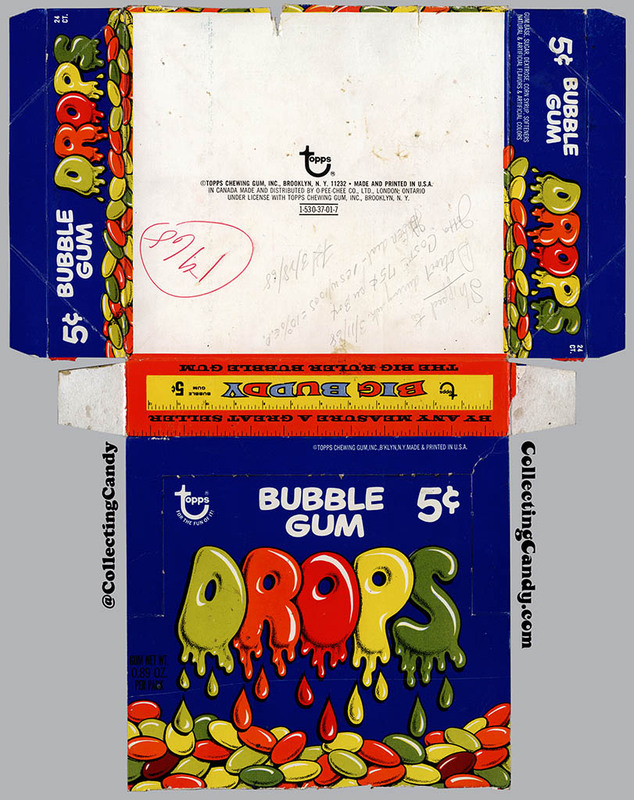 I took it upon myself to write them a letter (found the address on the back of the wrapper) and told them that although I was a faithful fan, had spent many of hard earned “nickels” and “dimes” on their gums, that this was dangerous for a child or anyone to ingest this paint. I sent some of it back with the paint on it and ate the rest! The company sent me back a nice letter and huge box of almost every Candy they made. I will never forget this and forever will the a fan of Bazooka which is Topp’s. I had no idea you existed but am so impressed Jason that you have this beloved blog. I loved my penny candy and relive my childhood days and happy memories when I reminisce or think about it. Thank you for the blog and your work in the Comic Books industry!